This week, The New York Times featured “Trump’s Trade War May Create New Auto Jobs. In China.” It’s an in-depth look at how foreign carmakers operating in the United States are weighing tariffs on their bottom lines. Initially, a Republican-led congress appeared favorable, touting free trade. “Instead, manufacturers are girding for a protracted period of conflict that will disrupt supply chains and change the companies’ calculations about where to expand and where to cut back,” Jack Ewing writes. The article focuses on BMW, the largest exporter of autos from the United States. Already, the company has moved some production of its X3 sport utility vehicle from Spartanburg, South Carolina, to Shenyang, China, and experts predict the company will move some of its production of the larger X5 vehicle as well. Chinese leaders are welcoming BMW’s move and are allowing the automaker to increase its stake in a Chinese joint venture from 50 percent to 75 percent, an unprecedented deal for China to offer the foreign carmaker. BMW also is increasing its investments in the country, spending $3.4 billion to expand its Shenyang operations and hire 5,000 more workers within the next several years. Leaders in South Carolina, on the other hand, are worried more jobs will be taken away because of the tariffs. BMW’s Spartanburg production dropped 6 percent in September, leaving 10,000 employees worried about their jobs. H. David Britt, a member of the Spartanburg County Council, registered alarm at a Senate Finance Committee hearing last month. As the tariff war escalates, other automakers with American employees, including Mercedes-Benz, Volvo and Daimler, will have to decide whether it is better for them to shift jobs elsewhere. For example, ZF, a major German auto industry supplier, recently announced that it will build a factory in China to support BMW’s Shenyang operations. However, new, revised trade agreements with Mexico and Canada require automakers to use more components made in the United States. This could encourage suppliers to expand their operations to support demand. But high prices and the rising interest rates on auto loans could curtail U.S. market demand for cars and offset any job gains. For now, the future of jobs in the U.S. auto industry remains uncertain. Some of President Trump’s promised tariffs have not yet been enacted, but others may be in the pipeline. As a result, many automakers and auto industry suppliers are left waiting. Risk management is essential when a supplier gets hit by a hurricane or a tornado, just as its crucial when government policies affect trade. Important supply chains decisions must be made for the short and long terms. As we launch this new association, ASCM, we are gearing up for exciting and dynamic new products and services. However, we remain committed to the APICS certifications you’ve come to trust, APICS Certified in Production and Inventory Management, APICS Certified Supply Chain Professional and APICS Certified in Logistics, Transportation and Distribution. 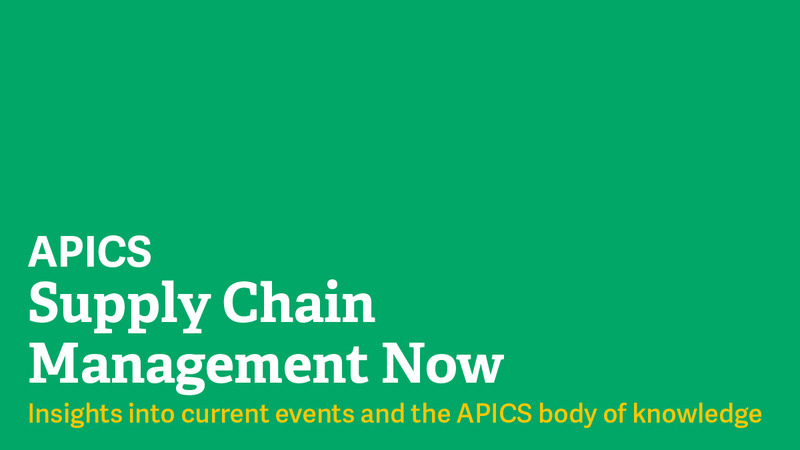 All APICS certification courseware includes important lessons about risk management. To find out more about ASCM and APICS certifications, visit ascm.org.